Eco-friendly earphones from thinksound | What Hi-Fi? 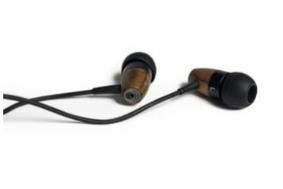 Aiming for the smallest eco-footprint possible, the thinksound earphones are made from renewable real wood sources, the packaging is from recycled materials and even the cabling is PVC-free. You'll find no bubble wrap in the packaging and even the supplied carry pouch is using cotton that's again from renewable sources. But thinksound claims to take its sound just as seriously. Three models are available, the thinksound rain, thinksound TS01 and thinksound TS02 + Mic. The entry-level model is the thinksound TS01, which is 'works with iPhone' capable, has passive noise isolation, a 'tangle-resistant cable' and four different sized earbuds. It's yours for £49. The rain model is similarly specified but comes in a cherry and white finish and will set you back £59, while the TS02 + Mic brings a microphone plus call and music control to the party for £65. Head over to the thinksound website for more information.